Once upon a time, eating vegan almost automatically equated to eating low-fat, low-cal, and healthy. Today, that’s not necessarily true anymore. Two of today’s hottest vegan trends are high fat, high calorie nut-based “cheeses” and cashew “cream” sauces, and coconut oil. Ready-made vegan frozen food and meat substitutes in supermarkets are often high-calorie and high-fat (not to mention highly processed). And rich, caloric vegan desserts are everywhere! So, to start the year and help with New Year Resolutions, I am reviewing several low-fat, low-cal veg cookbooks. The first in the series was Happy Herbivore Light & Lean. 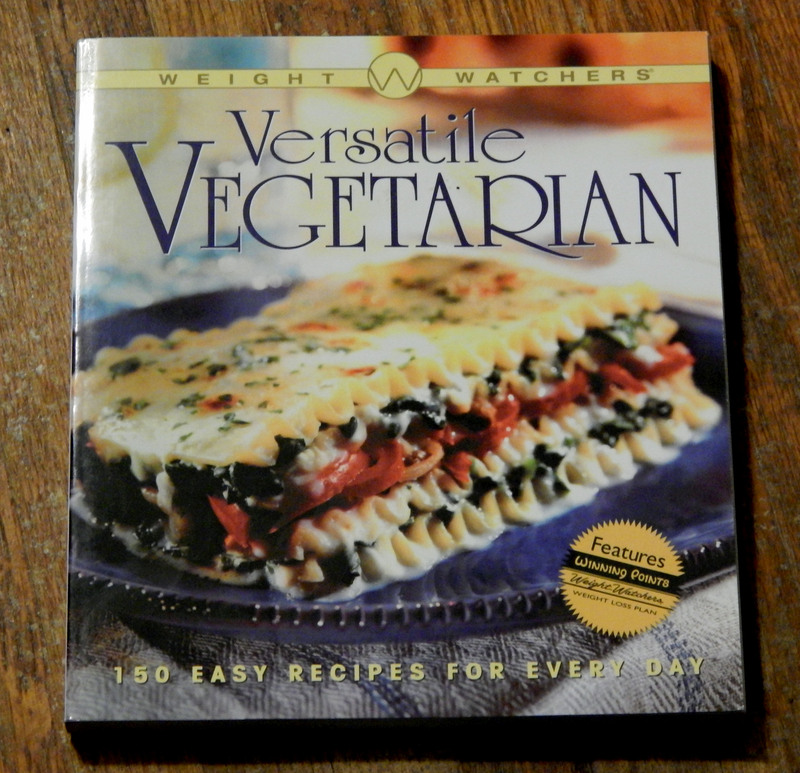 Today, it’s an oldie but goodie – Weight Watchers Versatile Vegetarian. First, don’t be turned off the name. While some vegetarian cookbooks are mostly eggs and cheese (the Moosewood cookbooks come to mind), about 75% of the recipes in this cookbook are vegan. And most of the ones that aren’t can be easily “veganized” by leaving off the cheese, or substituting Daiya cheese or perhaps a spoonful of nutritional yeast. There are only a few recipes that would be difficult to veganize (including the lasagna pictured on the front of the cookbook). Very complete nutritional information. Perhaps you are diabetic or borderline diabetic and tracking your food exchanges. Each recipe breaks those down (i.e., 1 bread, 1 fruit/vegetable, 1 fat). Following the Weight Watchers plan? The book gives you points for each recipe. And, finally, for the rest of us, you get a breakdown of calories, total fat, saturated fat, cholesterol, sodium, carbohydrates, fiber, protein, and calcium. Lots of helpful symbols – one-pot, make-ahead, microwavable, rush hour, spicy. Recipes are simple, but not too simple. For example, fresh onion and garlic are used, not onion and garlic powder. A variety of individual spices are used – both dried and fresh – instead of, for example, “Italian Spice Blend.” You make your own salad dressings for salads instead of relying on bottled. Emphasis on beans, grains, and veggies. No fake meats, and only a few recipes with soy (tofu or tempeh). Very few recipes with nuts. Quite a bit of variety and varied ethnic influences – Italian, Greek, Mexican, Indian, Moroccan. Ingredients are, for the most part, very “normal.” Intermediate cooks probably have most of the dried spices and pantry ingredients already. Beginning cooks might need to make a few stops at the supermarket, but the majority of ingredients should be easy to find. It’s an older book (2001) which means you can purchase it very inexpensively! Amazon is currently offering lots of copies starting at just a few cents + $3.99 shipping. Apparently, since publication Weight Watchers has either converted to, or added, a new Points system. I’ve heard it’s not difficult to convert the values; however, I don’t know much about the WW program so if that is a concern you may want to Google for more information first. There are some non-vegan recipes in the book, which may be upsetting for some vegans. I’ve got tons of WW cookbooks from my Weight Watchers days (dating back to the early 1990s) but have never seen this one. They also have lots of vegetarian and vegan recipes on their website, too. I still use lots of my old WW recipes. I haven’t checked out their website …. but I will now! Very impressed with the cookbook! This sounds like a very interesting veggie cookbook! It is … especially since it is now sort of “vintage”. Ahead of its day!